Jersey City, NJ (May 22, 2017) WinnCompanies, an award-winning national multifamily development and management company, and Greater Bergen Community Action (GBCA) today joined with Jersey City Mayor Steven M. Fulop and New Jersey housing leaders to celebrate the completion of a $40.2 million rehabilitation project that will preserve affordable housing for 400 residents for three decades. The top-to-bottom renovation effort at City Crossing, formerly Brunswick Estates, completely modernized the property's 131 apartments, grounds and safety systems; created new community space; and, addressed substantial deferred maintenance needs, including damage from Hurricane Sandy and ADA compliance issues. 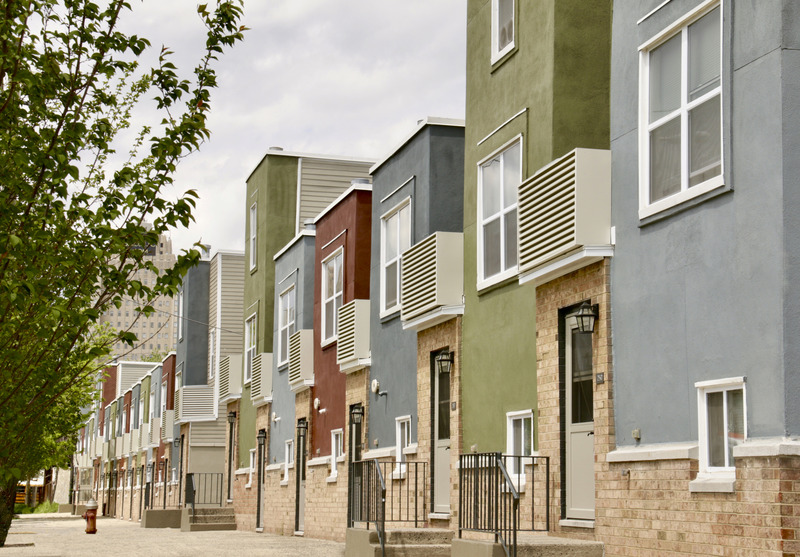 City Crossing is a great example of how a single housing redevelopment can strengthen a community in many important ways, said Gilbert Winn, CEO of WinnCompanies. Working together with government and financial partners, we not only delivered quality affordable homes with services that offer residents a brighter future, but also provided significant immediate as well as long-term economic benefits for Jersey City. Improved landscaping in the courtyard and portions of Montgomery Street working with the city's Division of Parks and Forestry's Street Tree Planting Program. A major focus of our administration has been on increasing affordable housing throughout the city and we have added more units in four years than the previous 10 combined, so as the city grows, so too do opportunities for all residents," said Mayor Fulop. This project is important because it preserves affordable housing in the downtown area for years to come, while also providing a full renovation to the properties both inside and out so that residents have quality, affordable housing." Under WinnCompanies' ownership, the City Crossing community, which offers rare three, four, and five-bedroom units, will remain 100 percent affordable for the next 30 years. In addition, GBCA is bringing new services to residents, focusing on workforce development and employment opportunities, along with early childhood and family development programs through Head Start. Greater Bergen Community Action works to build more sustainable families, community institutions and neighborhoods through strategic investments in household finance, education, housing and workforce development, said Robert F. Halsch, President and CEO of GBCA. Partnering with WinnCompanies, a quality developer of affordable housing, enhances our capacity to improve the quality of life for 400 of Jersey City's most vulnerable residents. Today marks the beginning of a brighter future for City Crossing. In addition to GBCA, the public-private partners in the project are: The Jersey City Division of Community Development; the New Jersey Economic Development Authority (EDA); the New Jersey Housing and Mortgage Finance Agency (HMFA); the U.S. Department of Housing & Urban Development; Citi Community Capital; The Richman Group Affordable Housing Corporation; New Jersey Community Capital (NJCC); and, Boston Community Capital. Located on the edge of downtown Jersey City, City Crossing is not far from gentrifying neighborhoods where the average price for a single family home exceeds $500,000. WinnDevelopment and GBCA acquired the 33-year-old property in December 2015. Completed in phases to minimize disruption to residents, the project met or exceeded all workforce goals. Of the 146 people who worked on the rehab, 108 were minorities and 38 were Section 3 qualified, meaning they were low-income residents from the immediate area. Of the more than 45,000 labor hours recorded, 74 percent were performed by minority employees and 39 percent were performed by low-income residents from the area. Jersey City and Hudson County residents made up 59% of the project workforce. In addition, 26 workers were hired for full-time employment on future construction projects. City Crossing is expected to continue to add value to the community by providing approximately $7.1 million in ongoing economic output and approximately $402,000 in state and local taxes annually, according to the HMFA. The rehabilitation of the apartments at City Crossing will not only improve the quality of life for all residents, but contribute to the overall improvement of the neighborhood, HMFA Executive Director Anthony L. Marchetta said. This redevelopment helps ensure both the availability and accessibility of safe, decent and affordable housing for working families. The modernization of the City Crossing residential property has not only increased its energy efficiency, but has added amenities that will help to foster a sense of community and well-being, said EDA CEO Melissa Orsen. This project reinforces several key objectives of the Economic Redevelopment and Growth Program, including the investment it brings to a targeted urban area and its proximity to transit access. NJCC believes housing can be both affordable and high quality, and the rehabilitation of this property has proved that this is possible to the 400 residents who live there, said Wayne T. Meyer, NJCC President. This public-private partnership has brought tremendous resources to this community and NJCC is thrilled to have been involved. The Richman Group is proud to partner with WinnCompanies on the redevelopment of City Crossing, said Aaron Wolfe, Vice President, Richman Group Affordable Housing Corporation. The demand for affordable family housing in Jersey City has never been higher. Thanks to WinnCompanies and significant funding from a committed group of public and private investors, the 131 units at City Crossing will provide attractive, safe and affordable housing in the community for years to come. WinnCompanies has assembled an extraordinary team of public and private entities to address the challenge of providing high quality affordable housing to those who need it in Jersey City. The end result is the preservation and rehabilitation of 131 affordable units for the families residing at City Crossing, said Bryan Dickson, Director, Citi Community Capital. Citi is pleased to play a role in this effort by providing $27 million in construction financing and $13.8 million in permanent financing for the redevelopment initiative. Congratulations to everyone involved for a job well done! DiMarco Constructors of Rochester, NY, was the general contractor on the project. The Architectural Team, of Chelsea, MA, was the architect. Property management services at City Crossing are provided by WinnResidential, which manages 19 properties totaling more 2,300 apartment units in New Jersey, including five others in Jersey City and additional properties in Bridgeton, Glassboro, Newark, East Orange, Orange, Red Bank, Thorofare and Trenton.